The former Fifth Ward Hotel, built in 1882, is a near-miraculous survivor of Victorian architecture in Houston. After a fire gutted the building and took down the top two floors, the building sat vacant for many years before finally undergoing a complete restoration. In 2003, m ARCHITECTS undertook the design of the interiors for use as an architecture studio and part time art gallery prior to moving in. 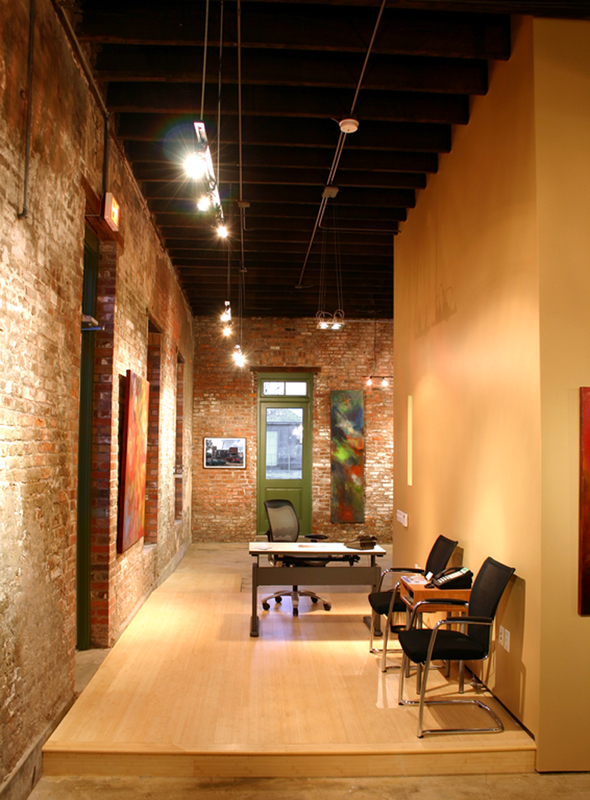 With the neighborhood in transition from an artists’ enclave into more commercial uses, the gallery was the perfect strategy to tie into the area’s past and preserve a portion of its character. The gallery’s mission is expressly intended to foster emerging artistic talent in the Houston region for those who otherwise could not acquire gallery representation on their own. 100% of the sale of the art is retained by the artists, and often the space is a participant in regional art festivals and exhibitions.